Monday December 9 1907 It was nine years today since Edith died and three weeks since Father was buried. It rained all day do I could not go down to finished Mothers dress. I did not have so much house-work to do so I made a tatting collar for the M.E. Bazaar. I began another in the evening. 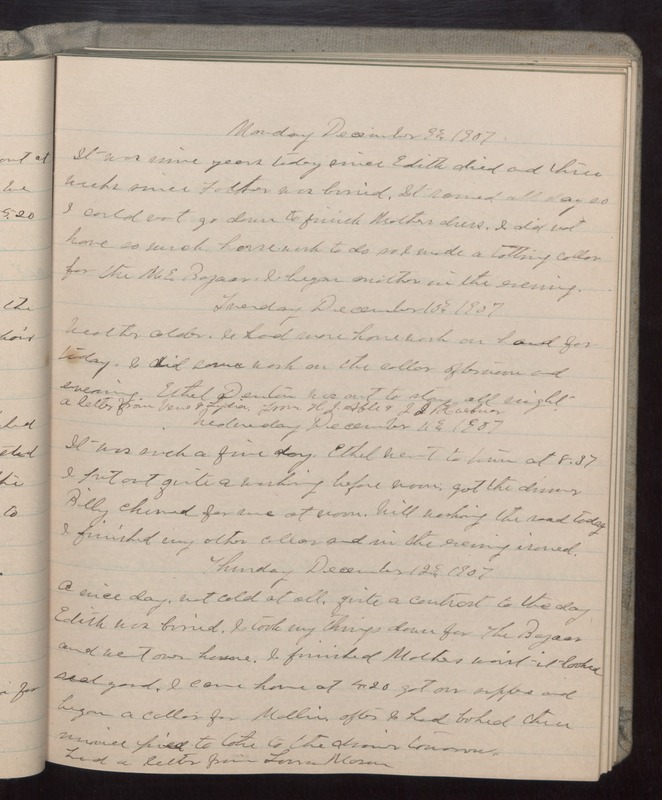 Tuesday December 10 1907 Weather colder. I had more house work on hand for today. I did some work on the collar afternoon and evening. Ethel Denton was out to stay all night. A letter from [Vera?] & Lydia, from H.J. Able & J. J. [Haebuer?] Wednesday December 11 1907 It was such a fine day. Ethel went to town at 8.37 I put out quite a washing before noon. got the dinner Billy churned for me at noon. Will working the road today I finished my other collar and in the evening ironed. Thursday December 12 1907 A nice dy. Not cold at all. quite a contrast to the day Edith was buried. I took my things down for The Bazaar and went over home. I finished Mothers waist it looked real good. I came home at 4.20. got our suppers and began a collar for Mollie after I had baked three mince pies to take to the dinner tomorrow. Had a letter from Lorna Mason.